Tickets are $65.75 and $45.75 and go on sale Friday, August 17th at 10:00am through Ticketmaster. Ticketmaster customers may log on to Ticketmaster.com or call Ticketmaster’s national toll free Charge By Phone number 1.800.745.3000. Tickets will also be available at the Mohegan Sun Box Office beginning on Saturday, August 18th, subject to availability. At the age of 92, Tony Bennett is not slowing down and his last recording, “Tony Bennett Celebrates 90” just won a Grammy Award for his son Dae Bennett who produced the album. This past November, the Library Of Congress presented Bennett with the “Gershwin Prize” marking the first time that an interpretive singer has been honored. The event was broadcast on PBS Nationally this January and featured tribute performances by Stevie Wonder, Josh Groban, Michael Bublé, Gloria Estefan and many others. Tony’s latest album will be a collaborative project with long – time friend and colleague Diana Krall. The album titled, LOVE IS HERE TO STAY, set for a September 14th release, celebrates the music of the Gershwins. On the same day, a new book, Tony Bennett: On Stage and in the Studio, will be released and provides an insightful look into Tony’s illustrious recording career highlighted by an extensive array of photographs, memorabilia and artwork. With worldwide record sales in the millions and dozens of platinum and gold albums to his credit, Tony Bennett is a musician who touches the hearts and souls of audiences with his legendary vocals and charming stage presence. His long list of achievements, spanning over 60 years, includes 19 Grammy Awards, including the prestigious Grammy “Lifetime Achievement Award,” making this artist a true international treasure. His signature tunes, such as “Steppin’ Out With My Baby” and “I Left My Heart In San Francisco” form part of the fabric of American music culture. 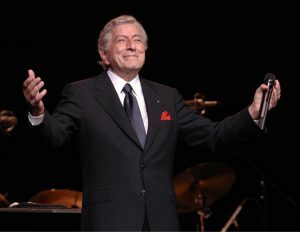 Having celebrated his 90th birthday in August of 2016, the milestone was marked by the presentation of TONY BENNETT CELEBRATES 90: The Best is Yet To Come a two – hour prime time special that aired in December. For more information on Tony Bennett, visit tonybennett.com.